If you love outdoor cooking and enjoy making the most of every ray of sunshine then this is the barbecue for you. Masonry BBQs are made from solid materials such as brick, slate or stone, depending on the style you prefer, so you can trust that they are designed to last. Masonry barbecues tend to be double walled, making them strong enough to withstand the seasonal weather changes, meaning you don’t have to worry about dismantling throughout the year. The masonry BBQ is designed to stay put all year round so should you see fit, you can enjoy dinner outside any time you like. Aside from their heavy-duty shell, masonry barbecues also benefit from powerful grills and stunning designs, guaranteed to put you at the envy of your neighbours. 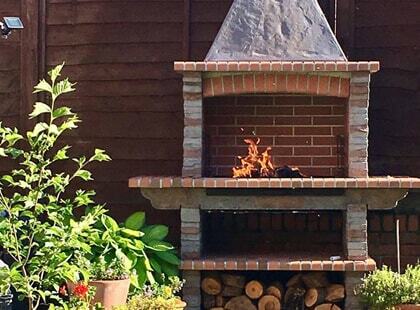 Commonly known as stone BBQ, Chimney BBQ or Brick BBQ, a Masonry BBQ is a favourite of outdoor cooking enthusiasts. Their strong shell means they have permanent residence in your garden or on your patio, meaning you can use them anytime with little effort. While the most common choice of fuel for them is charcoal, this type of barbecue provides you plenty of choice. You can burn a variety of fuels – wood chips, logs or charcoals but you can also look at installing gas burners. Masonry barbecues have a great degree of flexibility to accompany their longevity. They are a serious barbecue so if you fancy yourself king of the grill, we’d recommend you have a look at our impressive range. Widely purchased for their style element. Most BBQs manufactured in red masonry Materials look similar and have a Mediterranean feel to them. Our range includes a variety of stunning designs which is one of the most key factors in why they are a proven favourite with BBQ lovers, aside from their impressive cooking abilities. When looking for a stylish way to cook outside, people often want their furniture and cooking equipment to blend in with their garden design. Masonry BBQs certainly offer this option whatever your style whether it’s modern or traditional. Choosing a Masonry BBQ is also about the style and appearance, and not just the barbecue performance. As they can be made using stone, concrete and brick materials, you have a variety of options. Whether you prefer smooth stone, slate, house bricks or a mix of textures, we have a broad range so you can consider what will fit nicely into your current garden or outdoor area. If you’re not worried about the aesthetics that is fine, any one of our range will perform perfectly for you. We can also provide you with a choice of fuel – this year we are able to provide either charcoal or Gas versions. Using gas gives convenience, but not everyone’s choice. Traditionally having a chimney made of masonry, people prefer charcoal for the BBQ fuel. However, gas does work just as well, it is really down to choice and convenience. Delivery to a mainland UK address is free however there may be additional shipping charges to remote areas, please contact us for more information. 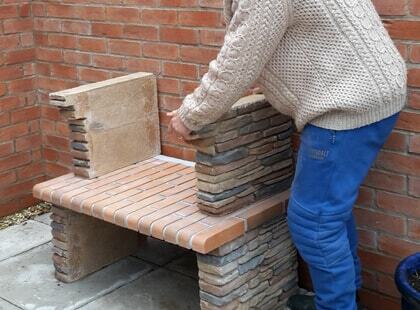 Building one of our Masonry BBQs couldn’t be easier! They are all delivered in separate sections on a pallet. These pre-built sections simply need stacking on top of each other with some adhesive. 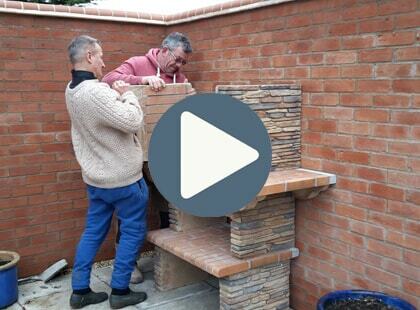 Check out the video on this page to see some of our satisfied customers building their Mediterrani Masonry BBQ on their patio. We think it looks great! At first your new Masonry BBQ may still hold some of the moisture from the manufacturing process, so don’t worry if the BBQ turns a slightly lighter colour after a few uses as the fire will dry out the last bit of moisture. Learn more about how we deliver large items by a palletised delivery service. 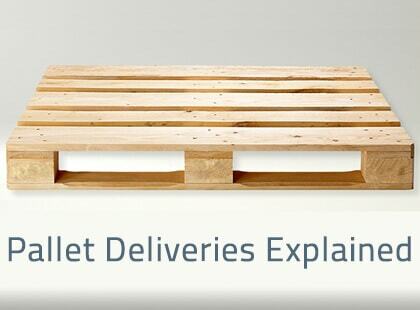 It's important you understand the process taken to deliver a product on a pallet.